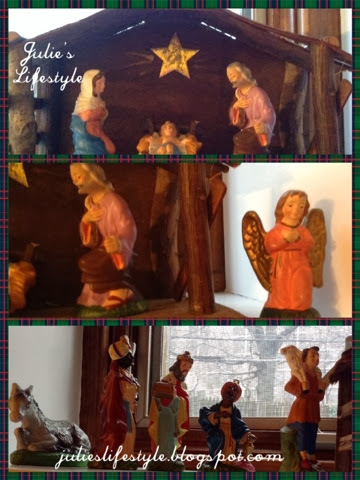 Here at my house I would love to show you some of my Christmas decorations! Step inside and have a look with me. 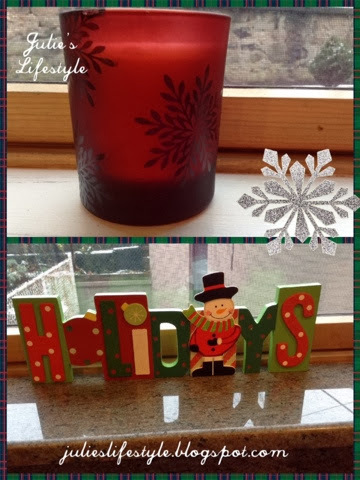 On my kitchen window sill I have this red candle that I light up each night when we have dinner and it looks so festive. On my window sill near my kitchen sink I have this holiday sign with a happy snowman on it. 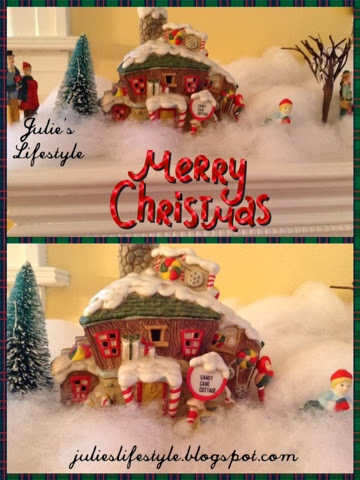 Here is a gingerbread house that lights up, sings Christmas carols, and the snowman and gingerbread man move around in circles. My husband's aunt and uncle gave this to my daughter when she was little. I have this sleigh with Santa on it that holds all my Christmas cards. 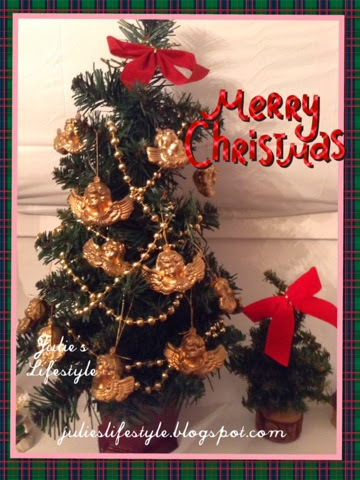 These two mini Christmas trees are my daughter's and she decorates them each year with gold angels and beads. 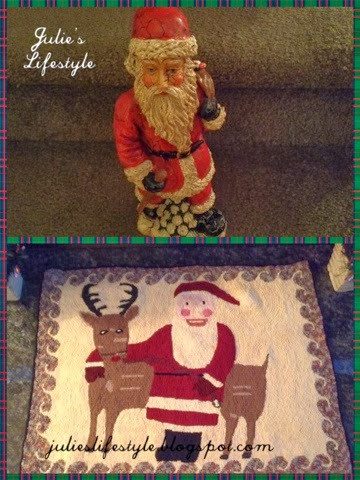 This is a crackled old looking Santa that I have near my lamp and this Santa rug is on the fireplace floor. My mom and I were shopping many years ago together and we each bought one. 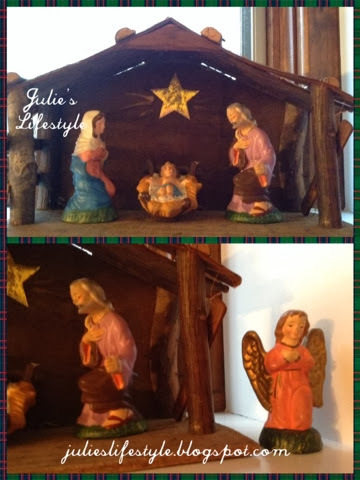 This manger set was my Mom and Dads and my Mom gave it to me many years ago. I love how rustic it looks. I have it displayed on my window sill in my living room. I love this Candy Land village that my sister gave to me before she died in 1992 of cancer and I put it out each year in remembrance of her. She was only 30 years old when she died! 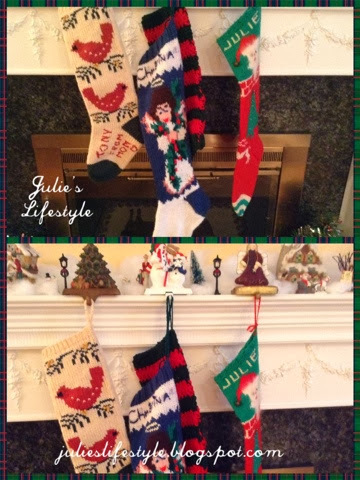 The stockings that are hung up on the mantle are handmade and knitted by my Mom. Thanks Mom we love them. On the top of my tree I have this fabric angel which I think gives it a country feel. 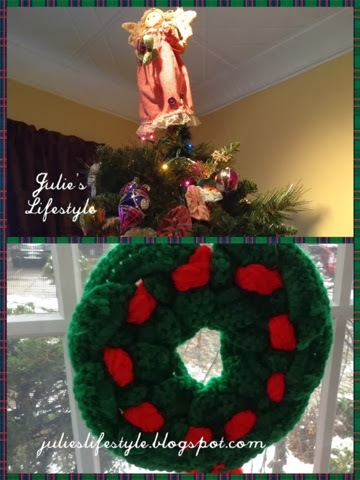 There are three crocheted wreaths in my bottom windows and upstairs I have 2 crocheted wreaths displayed in the windows too. This is what my Christmas tree looks like in my living room. The tree is large about 7.5 feet tall and not real since I have allergies. 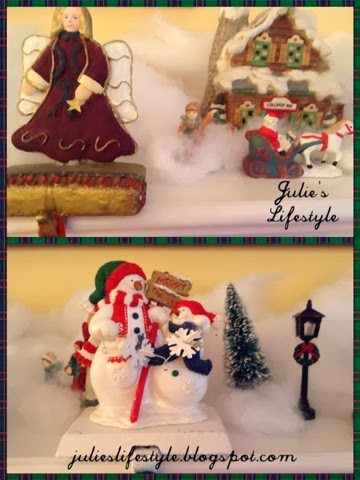 You can see some of my ornaments displayed and I love them all. 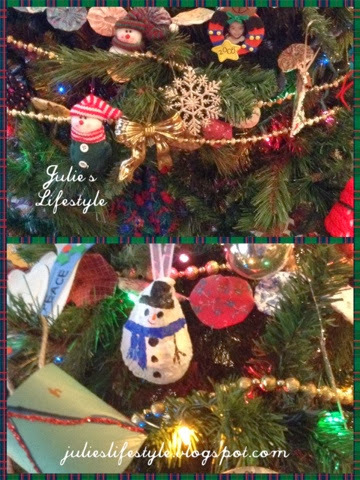 The shell snowman ornament my Mom made for us and you can find the snowman in the bottom picture. The post and tutorial are HERE to make one for yourself if you like. The gold snowflake ornaments were given to me by Anne at the blog Stuff & Nonsense recently. 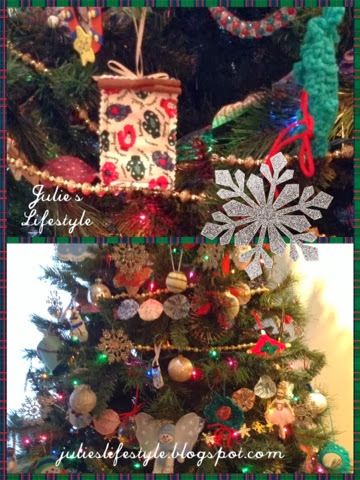 I participated in an ornament exchange that my friend Vicky at Life on Willie Mae Lane had hosted and you can read about it HERE. 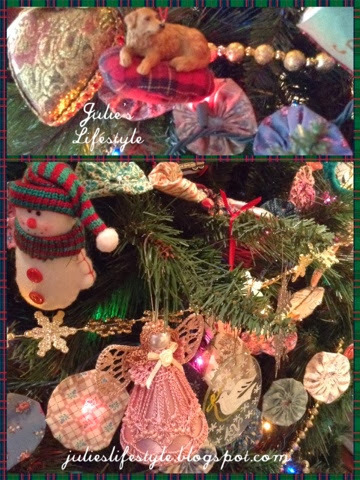 The yo yo fabric garland I made many years ago and I love using it on my tree to give it a country feel. To make these yo yo's you can find a tutorial at Stephanie's blog The Enchanting Rose HERE. Most of my ornaments on my tree are homemade and I love them. Did you like my Christmas decorations? I hope you are all having a wonderful holiday and Christmas will be here in two weeks so I'm wishing everyone a Season's Greetings from my house to yours! I will be sharing this at The Charm of Home and other parties. Love all your ornaments. 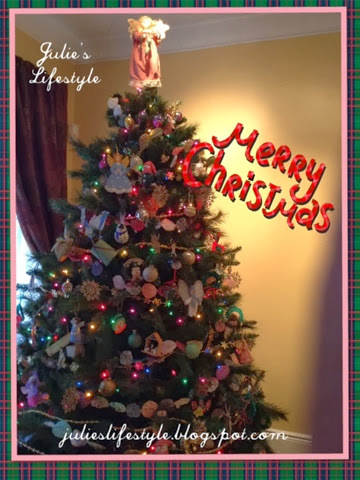 Thanks for sharing your beautiful tree on Creating Christmas. Everything is lovely. It feels warm and inviting. Thanks for sharing at Thursday Favorite Things Blog Hop. Very pretty, love the gold tree! Julie your house looks great. I really love the hand knit stockings. Usually I like to decorate the whole house too but this year all I did was put up a tree. Time has gotten away from me but I enjoyed seeing your decorations. 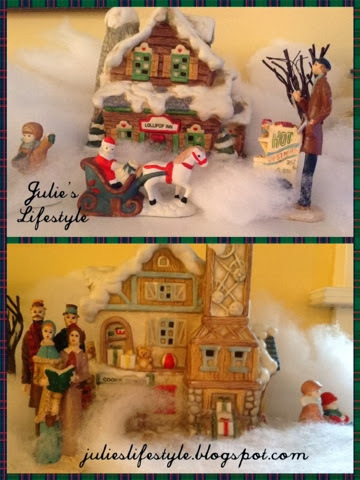 Your village is adorable Julie, and everything looks so warm and cozy! Everything looks fantastic. I think the cloth angel and the crochet wreaths both have a country feel, I guess because my aunt always had country decor and she crocheted quite a bit. :) Very nice work on everything, and that tree is gorgeous! Very pretty! I like how you have put so much thought into your decorations and have so many handmade and special things! thanks for sharing! I just LOVE your vintage looking Santa! He's perfect and what a great find. 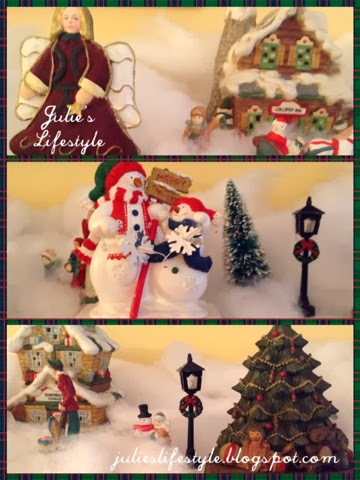 I love all your Christmas decorations - they carry lots of wonderful memories! Lovely home and decorations! thanks for linking to Snickerdoodle Sunday! Have an awesome holiday! Lovely Christmas decor! 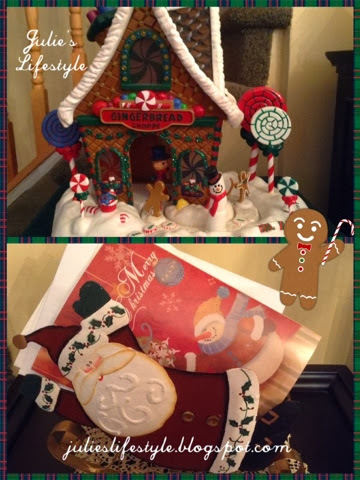 I really like the Candy Land village, the Santa rug, and the gingerbread house. Cute! Thanks for sharing at Submarine Sunday! So pretty, Julie! I love the snowy scene and the entire sweet feel of your decor!